Another year has sailed by and tomorrow I leave 55 behind me for good. 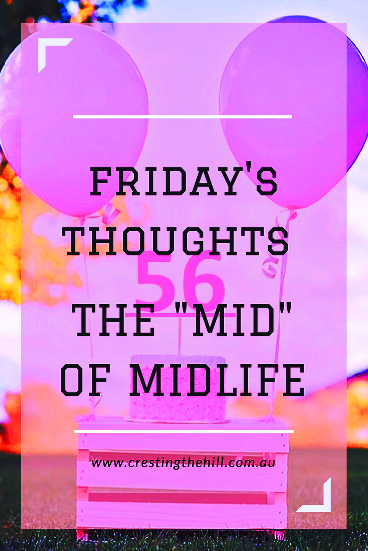 I think I saw 55 as the Mid-point of Midlife. If this stage encompasses 40-70 (approximately) then 55 was the exact middle - now I'm about to become 56 and I really feel like I'm looking back at what has gone and at the same time wanting to make the most of what is yet to come. There is no getting past the fact that the first half of my life is well and truly over. I've been a child, a teenager, a daughter, a girlfriend, a wife, a mother, a friend...and so much more. A lot of those roles are gone but some still continue to grow and develop. I like that they have been leading me towards the second half of life and preparing me for what is yet to come. I can't undo anything that has gone before - I can be proud of a lot of it, and learn from the mistakes I've made. I'm so grateful to have had such an abundant life - maybe a life that is smaller than some get to experience, but one I've been content with and I have no lingering regrets, just a sense of having done the best I could wherever possible. Anyone who reads my blog knows I love a great quote and there are a couple that I wanted to share that sum up how I'm feeling now. This one by Michael Lipsey really spoke to me because it says it so beautifully. And this one by Kristin Armstrong is what I'm aiming for in the years ahead. The second half of life is underway and I don't want to waste any more time. I'm starting a bucket list of things to do before I turn 60 and there's only four years left! She mentions so many things that I've been learning about letting go, valuing my voice, not trying to please everyone, letting go of toxic people, and knowing who I am. I have no idea what the year ahead holds, but I have no doubt it will be full of really good things. There is sure to be a little heartache in the midst, because life always has sunshine and rain (and rainbows). I think I'm ready for whatever comes my way and I really believe that I'm up to the challenge. I want my Midlife to be about living fully - not dependent on others but appreciating the people who want to be in my life and happy to share the journey with me. It's an exciting time if you choose to celebrate it and I intend to make the most of every minute. 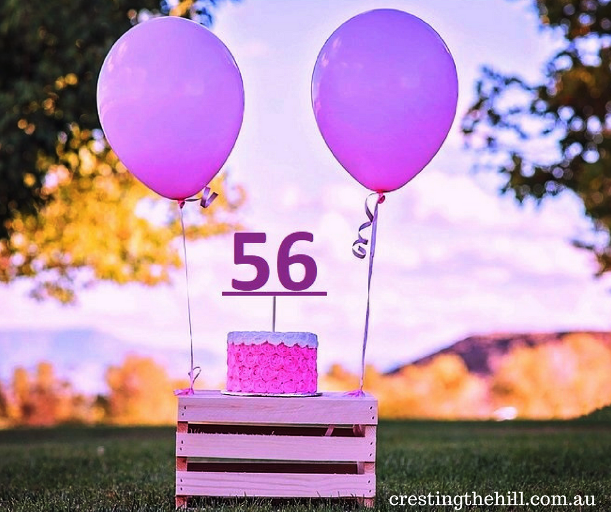 Is Midlife a celebration and an adventure? Or are you still trudging up the hill and dragging your feet? It's really all about how we choose to look at things and if we choose wisely then we can enjoy the second half of life even more than the first. I really love these thoughts. I'm going to remind myself not to "give my power away." Well timed message! 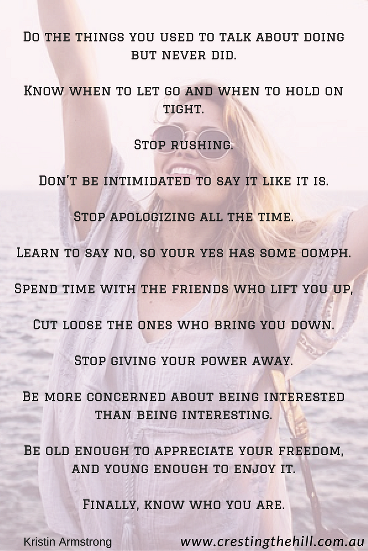 "no" has become much easier to say as I've gotten older Susan - I think I probably need to say it less than I expected to because I don't have many toxic or demanding people left in my life these days. Happiest of birthdays to you! It just keeps getting better and better from here on, I promise! Thanks so much Marcia - I don't think you're much further down the road than I am, but I'm expecting it to keep being great as long as I keep my attitude positive. Leanne, Happy Birthday! I'm always amazed at how prolific and good you are as a writer. Truly inspiring. As for the middle years, I'm one of those weirdos who find the later years quite exhilarating. Rock on. Baby Boomers are still re-defining midlife, so this idea of old is gone for good! Happy birthday, Leanne! In a few weeks I'll be two years closer to 60. I think you're right about redefining this stage of life Terri - I certainly feel more positive and more empowered than I ever expected to - and it certainly wasn't something we say in previous generations. I'm so glad to be living in a time where Midlife is celebrated. Great thoughts and reflections (as usual), Leanne! Thanks so much for the birthday wishes Donna - it's not the Camino Trail, but it's still a great day and I'm having fun! I wished you a belated birthday so I hope you are HAVING a Happy Very Happy birthday! Even though there is longevity in my family I am still past midlife because I just want to live to 80, 85 tops if I am still healthy. Each year healthy is a blessing and an opportunity to do something new and fun! I've noticed that the quality of life for most people starts to really spiral down after they turn 80 Haralee - I'm not sure whether we'll be lucky and live more robustly, but I certainly don't want to live past 85 if it's as a decrepit old person. I love these quotes. We should be thankful that we are in a place where we can define our own lives going forward. It will be as good or bad as we make it! I loved them too Michele - they just really define what Midlife is for us if we choose to embrace it. Happy Belated Birthday and just remember like fine wine you are getting better and better all the time! Fine wine should never be consumed too soon! You are just getting to the top of the hill enjoy the ride. Thanks so much - I had a lovely day and I think the top of the hill looks pretty fabulous - and we are definitely getting better with age! Very nice quotes and I hoped you had a wonderful birthday. Thanks so much and I had a really nice birthday - they seem to come around a lot faster these days though! Thanks for the birthday wishes Roseann and I am workign very hard at doing the things that I've talked about - still got a few left on the list though. Great post. I love a good quote too. Hope you have a lovely time celebrating your birthday. I like the quotes very much! 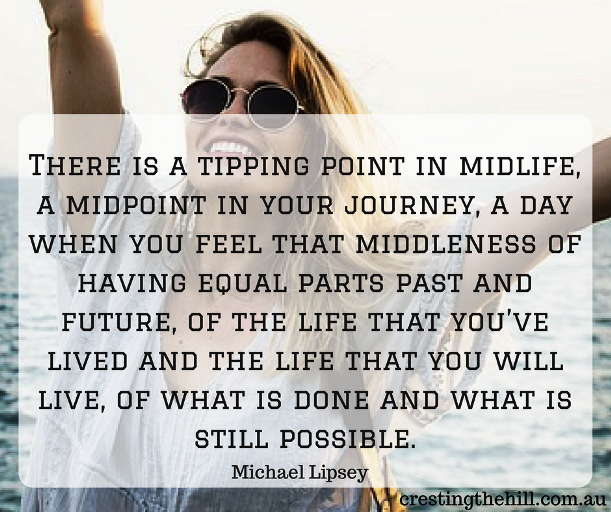 I'm still in early midlife, but am always thinking about how to make the most of each moment. I think when I turned 40, I felt the savor of life. I wasn't always rushing around, I wasn't doubting myself as much. I can't go back and give my 20 year old self the gifts I now understand at 40. But I can take them with me as I move forward. Thank you for the chance to ponder this mid-point of mid-life. I've got another birthday coming up and I want to love every minute. Hi Angela! I really like how you said said that you can't go back and teach your 20 yr old self, but you can carry the gifts forward. That's what makes getting older so much easier - we learn and we apply and we appreciate - all great things in life! That's not necessarily a bad thing Jeremy - I think we all reach a point when we wake up and realize we aren't in our 20's any more (it takes longer for some people!) and that's when we start moving into a new (better) phase of life - you might just be hitting the beginning of Midlife! I trust you had a happy birthday, you have bought us all so much pleasure as we read your wisdom. I hope there is much more to come. So we had better feature this post to celebrate with you.